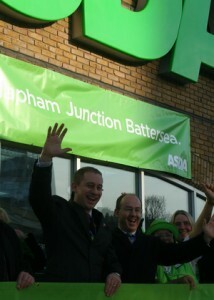 Thank you for taking the time to email ASDA regarding our Clapham Junction store. I am sorry to learn of your disappointment as you believe we are incorrectly naming our store. I have followed this important issue up with Mick Beck the General Store Manager, who has confirmed that the store has always been called ‘Clapham’. As the store is just off the Junction we believe it is valid to call the store by its current title. We also feel if we were to change the stores name, it would lose some of stores current identity. I will happily pass your comments onto the Suggestions Team who can consider this matter further for you. Thanks again for taking the time to contact us, please let me know if I can be of any further assistance. The Stalinist approach to revising history is astonishing. Given that they themselves rebranded their store two years ago reveals a shocking lack of self-awareness. They themselves have in the past accepted the store is in Battersea. They changed their branding. But now a new manager knows better. I can’t help but find it incredibly patronising to be told by someone in Leeds that we don’t know where we are. As if local people, supposedly their customers, are so moronic we do not know where we live or what our area is called. Nor have memory enough to recollect (or just dig out the photographic evidence) that their assertion is at best a reflection of being too lazy to check and at worst a blatant lie. If they can’t be bothered to even look at their own website to see that even they still refer to it as Clapham Junction in Battersea it makes you wonder how much effort they put into anything else. There’s clearly an attitude that the customer is always wrong, and a little tiresome. “As the store is just off the Junction we believe it is valid to call the store by its current title” – don’t they realise that the Junction itself is not in Clapham, but Battersea? Idiots! Maybe it will be discussed at the new CJTCP meeting … where we might see a representative of ASDA.